For years now, nonprofits of all shapes and sizes have known that to really make the most of your efforts, you need to find the right nonprofit software solution. However, with so many types of nonprofit software out there that all aim to address different areas of your operations, deciding on what kind of tools to invest in can be a real sticking point behind the scenes. If you’re a member of an advocacy organization, a nonprofit group, or another form of 501c3, it’s time to take a second look at what options are out there, how to get more out of your solution, and what tools are really necessary. Know what type of nonprofit software you’re looking for. Find out how donor management software can streamline operations. Leverage digital marketing to build your community. Consider which online fundraising tools can boost giving. Check out online advocacy software to further your mission. Ready to dive into the world of nonprofit software? Let’s get started finding the solution you need! 1. Know what type of nonprofit software you’re looking for. When shopping for nonprofit software, many organizations report that they aren’t sure which tools are right for their team’s needs. Not only that, but some nonprofit leaders also express regret over investing in the wrong solution. In the nonprofit world, there’s nothing worse than realizing you’ve made the wrong investment! You want to maximize your operation’s budget to be able to give back as much as you can to your mission, so it’s not hard to see why the stakes are high. Keeping up with your community of donors, volunteers, and supporters. Processing donations on your website through your giving forms. Leveraging social fundraising strategies like peer-to-peer fundraising campaigns. Maintaining relationships with donors after they make gifts. Spreading your message online and getting people excited for your mission. No matter your constituency, all organizations struggle with their strategy at some time or another, and the issues above are very common among all kinds of nonprofits. Donor management software. With this solution, your team can learn more about constituents and better manage relationships over time. Digital marketing tools. These allow your nonprofit to make the most of email, social media, and other online channels to spread your message and effect change. Online fundraising solutions. Since most of your donors will want to contribute over the internet, your team needs a robust online fundraising solution. Nonprofit advocacy software. Getting the word out about your mission requires expert tools so you can reach the right voices and amplify your advocates. Do any of these solutions sound like the right fit for your organization? In the following sections we’ll expand on each kind of nonprofit software and outline the exact tools they can offer your team. Bonus! Check out our list of our favorite nonprofit software solutions to get started on your search. 2. Find out how donor management nonprofit software can streamline operations. If your nonprofit doesn't yet have an effective donor management system in place, it’s time to take notice. Effective organizations are empowered by donor management systems that streamline their operations, provide a rich knowledge of their constituency, and offer informative analytics. Build effective donor profiles. Streamline what you know about your constituents so you can turn supporters into donors. Donor profiles allow your team to tailor outreach to your individual constituents, resulting in more effective relationships over time. Track donations with ease. See who has donated, who you’re stewarding, which past givers have contributed to your latest campaign, and other key data. With donation tracking tools, you can pinpoint where your fundraising strategy needs an update, too. Manage direct mail. Although digital strategies are increasingly popular, direct mail is still one of the go-to ways to connect with supporters. Leverage direct mail management tools to stay on top of your stewardship and solicitation efforts. Process informative reports. With informative data reporting, your donor management solution can be the tool you need to improve your operations from the ground up. Learn more about your supporters with intuitive dashboards and customizable metrics. Check out Salsa’s comprehensive donor management solution, Salsa CRM. With this unique software, your nonprofit can build stronger supporter relationships, optimize your strategy, and personalize outreach with each of your constituents. 3. Leverage nonprofit digital marketing software to build your community. When it comes to nonprofit organizations, smart digital marketing is the key to reaching your goals. Successful organizations need to have access to the right digital marketing tools to build their brand online and engage meaningfully with constituents. Enable marketing automations. Managing your different communication channels can be complicated, but with marketing automation, it’s a breeze! You can draft, schedule, and post consistent messaging via email and social media all through one nonprofit software platform. Maximize your email strategy. Email is your organization’s front line for making solicitations, inviting supporters to events, sharing petitions, and more. Make sure your software of choice offers best-in-class email management tools. Design sign-up forms. Does your organization host volunteer or fundraising events? Then your nonprofit software platform needs to offer easy-to-use tools that empower you to design intuitive sign-up forms for every occasion. Make social media connections. Social media marketing is also an important resource, especially when it comes to reaching new supporters. The ideal solution will let you strategize your social media outreach and connect with your supporters on their preferred platforms. Take a look at how Organization for International Change leverages Salsa’s intuitive digital marketing dashboard to draft and schedule social media posts. By carefully curating a their social media presence, they’re able to strengthen relationships with supporters online while building their brand and spreading a consistent message. 4. Consider which online fundraising nonprofit software can boost giving. Accepting and promoting online donations is one of the core elements of your fundraising strategy. When your nonprofit puts the right online fundraising tools into practice, you can make it a breeze for supporters to give. Create donation forms. There’s nothing more detrimental to your fundraising strategy than having unattractive, complicated online giving forms. Find a solution that allows your team to create intuitive forms and pages to drive donations. Launch peer-to-peer fundraising. Peer-to-peer fundraising is one of the most popular fundraising methods for social media-savvy organizations. With peer-to-peer fundraising tools, supporters can easily fundraise on your behalf and spread your message online. Register events online. Events are an important part of your nonprofit’s strategy, so you should have tools on hand to easily register attendees. Using registration forms, your team can better anticipate attendance and boost event fundraising. Automate gift acknowledgements. The best way to create lasting relationships with donors is to show them you truly appreciate their support. Automated gift acknowledgements ensure that they always know you care! Discover Salsa’s comprehensive online fundraising tools. By leveraging these powerful solutions, your nonprofit organization can create a best-fit online fundraising strategy that drives giving to your cause while fostering reliable relationships with donors. 5. Check out nonprofit online advocacy software to further your mission. For many 501c3 organizations, fundraising isn’t the only concern; rather, online advocacy is at the heart of their mission. Online advocacy software gives organizations the tools necessary to amplify their outreach, drive supporters to action, and effect lasting change. Design online petitions. 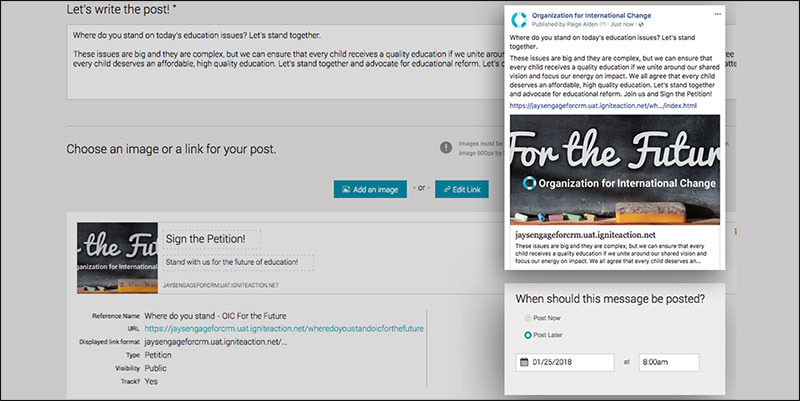 Expertly customize your online petitions so that they perfectly pair with your brand’s online identity. Choose a solution that lets you add compelling imagery and call supporters to action with smart buttons. Leverage targeted actions. Spark action among your community with targeted action tools. Features like Tweet a Rep/Facebook Message a Rep empower supporters to quickly make their voices heard online. Effect change with click to call. Click to call technology seamlessly connects your organization’s supporters with their legislators on the phone so they can share why your cause or campaign is meaningful to them. Use social advocacy tools. Social media drives online advocacy, so your nonprofit software should offer easy social sharing tools, matching features that connect email addresses to Twitter handles and Facebook pages, and other smart features. 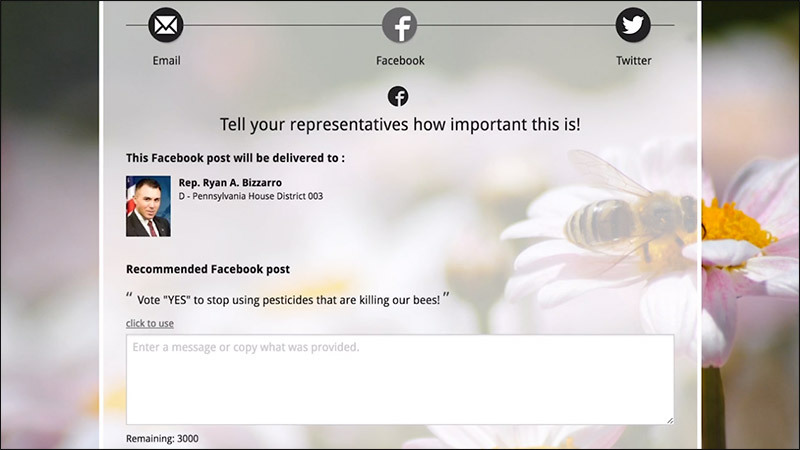 See how Save the Bees uses Salsa’s online advocacy software to build beautiful online forms? By designing an engaging online form that inspires supporters into action for their cause, this organization ensures that their mission will be amplified. When your nonprofit organization, 501c3, or advocacy group takes charge of your strategy with the right nonprofit software, you’re sure to see results!